Sometimes I have had a dog in the kitchen with me when I have been cleaning the oven. I'm not sure why the owners let the dog stay in the kitchen or perhaps I should have said, should say something. I think I've mentioned Barry and Dave the two Jack Russel terriers before. They were the two dogs that decided to run through the kitchen at high speed when I was cleaning their owners range cooker. Then I had the chocolate labrador who decided to help me by licking the grease off the doors of the oven I had dismantled. Then there was another Jack Russell who decided to get his nose in the grease I had removed, I gave him a nudge and then realised that as he had a dirty hand print on him so I chased him around the kitchen to catch him to clean the mark off which was well entertaining and frustrating at the same time. Anyway seems I wasn't alone as in last week's team meeting the guys came out with their oven cleaner's dog stories too. Alan had a rather large chocolate labrador, once, that sat right across the back of his legs when Alan was on his front cleaning a bit right at the back of the oven. Alan couldn't move with the weight – the owner had to get the dog off. Nigel had a dog that had a wee over his leg, and another one that tried to "hump" his leg. He also had one that when he stroked it it did a very nice pile of pooh right there in the kitchen. Nigel cleaned it up! When my 30 Amp AGA was fixed, the engineers from Spillers of Chard told me that the red switch on top of my AGA was to switch on the fan that vented all the smells etc from the AGA. Unlike on other AGAs where the smells etc go up the flue as the 30 Amp AGA doesn't have a flue you need to switch on the fan. So this was news to us! We've only had it for two and half years, oh well sometimes to can be ignorant. The reason I thought smells was coming out of the main oven door was because the door didn't fit properly. Apparently it was because I hadn't switched on the fan and it had nowhere else to go. So lovely all sorted now. So for 30 Amp AGA cooker venting switch on the fan by pushing in the large red push button. For the 13 Amp I'm not sure what to do but it will have a similar arrangement as like the 30 Amp AGA the 13 Amp AGA has a pipe that goes outside to vent the smells. For all other AGAs it will go out the flue. I've just got back from cleaning an AGA in Bristol. 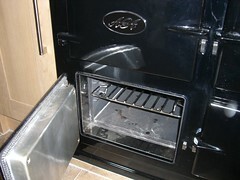 It is the sixth time that I have cleaned this particular AGA in a house in Clifton so they must really love what we do! :-). Today the AGAs owner said that her 19 year old son had just started showing an interest in cooking and was very keen on frying on the top of the AGA. So the top was particularly greasy. But in all it looked fabulous when I had finished. Interestingly as I was putting my money into the toll machine on the Clifton Suspension bridge, on the way back from the job, someone high up on the east side pier on the cliff top (I think he said this) "I'm on the top of the world". I looked up and there was someone shouting and there was a film crew with him. So it'll be interesting to see what TV series that will be in. We send our guys their jobs by emails to their phones which means they don't have to come into the office each day to pick up their jobs for a particular day. We usually ensure that the jobs are sent out to them before close of business the previous day. This works very well and means that they have their day's oven cleaning jobs all listed on their phones with all the contact numbers, addresses, postcodes, and job details they need etc. Well, can I add to this, that it generally works pretty well but sometimes we get a small problem or two, when happen generally from our guys gets things wrong when they don't read the details of the jobs correctly. Last Friday which was Good Friday one of our guys set off to work; someone had forgotten to tell him that it was Good Friday and therefore a Bank Holiday so he didn't need to work. He thought it was a normal working day and as he'd been sent the jobs the night before that's where he had to go. He didn't look at the header of the jobs though which was a big problem as if he had then it would have told him that it was in fact Tuesday's jobs and not Fridays. So off he went and knocked on the door the customer, punctual as ever he got there at 0900 am. But unfortunately the customer was a vicar and he wasn't happy to be woken up on this special day. So lots of apologies all round and then having the bank holidays off as a holiday our guy had to go back there again on Tuesday morning this week to do the oven cleaning and of course he again arrived on time but this time on the correct day!